"This article is the BEST article on questioning I have ever read and I'd like, with your permission, to pass it along to our mediators.Your examples of both genuinely open and 'not-so-open' with explanations are very insightful." See more of Your Comments about pages on this website. Effective questioning is the third communication skill in the cyclical process of Listening - Summarising - Questioning that promotes Effective Interpersonal Communication and Conflict Resolution. We then return to the start of the cycle by listening (effectively) to the answers we receive. This means the use of genuinely ‘open’ questions to draw out from those presently experiencing a destructive outcome in their conflict their own ideas for ways forward . It also means avoiding the use of questions with an 'agenda' otherwise known as leading questions. "What other ways could you communicate with your neighbour / work colleague / Doctor?" (This may follow a statement that someone doesn’t feel they can talk to someone else with whom they are having difficulties). "How about phoning your neighbour/ work colleague / Doctor?". Both ‘questions’, which are basically suggestions, are taking ownership away from the party by bringing in the mediator’s ideas based on their view of the world and how they think communication ‘should’ occur. 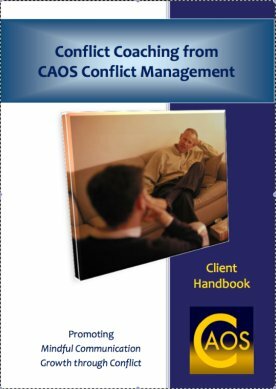 While many would say there is no harm in this (and I am particularly saddened when I hear mediators say this), or they may say "Well they can always say no to my suggestion", this overlooks the empowerment aspect of what mediation supports and why doing this fundamentally inhibits long term resolution of conflict. So what is/is not effective questioning? The suggestions are immediately providing solutions for the disputant. This implies a presumption of inability on the part of the disputant to create their own ideas, or if this presumption is not intended, it is trying to solve the problem for them even if they can create their own ideas. This also ignores the possibility that the suggestions may be inappropriate for the people involved in that they may not be able to write or they may not want to use the telephone to communicate for some reason. b)	rejects it and has to justify to an outside person their reasons for not taking up the suggestions. If they follow a) - accept the idea - then this means that the party is abdicating their ownership of their situation in the future and, if the suggestion doesn’t work, will be able to blame the mediator for not coming up with the ‘right answer’ to solve their continued and escalating dispute. This distances them further from recognition of their own response-ability, reinforcing their sense of despair in the situation, because no-one ‘out there’ is helping them. The mediator's rescuing has continued to blind them to this recognition. If they follow b) and reject the 'mediator’s' idea they will have to deal with rejecting a perceived authority’s advice on disputes (a false view of the role of the mediator, but one which is reinforced by the directive approach the mediator has taken). This creates an added stress and complexity when they already have their dispute to deal with. An open question causes neither of these difficulties as the disputant creates their own ideas for communicating through their own answer to the open question "How else could you communicate…", thus reinforcing a sense that they have response-ability and responsibility to move themselves forward in the situation. It also means they don't have the added burden of having to reject something being suggested to them. Sadly, sometimes those involved in ‘helping’ people in dispute, including some mediators, will say…. "But what if they can’t think of a way of communicating?". At this point, I hope it will be seen that the ‘Rescuer’ in us can sometimes be quite patronising and arrogant. While people may not immediately know an answer to an open question asked, they will always be the experts in identifying what works for them. Even if they do not know their answer when asked, they will still be able to identify one at some other time rather than need the Rescuer to identify it for them at that moment - as if it is essential that they answer it when the questioner asks rather than in their own time. Ownership is being taken away if the Rescuer insists on this rather than accepts the person in dispute is wanting to mull over their thoughts about their situation and may not be able to decide an answer at that time. It is crucial that anyone trying to support conflict resolution accepts any answer that is given to an open question that they have asked, rather than judge it as good or bad or pass some other opinion about it. Otherwise they have lost their impartiality and are back to the Rescuer syndrome again. To pass a judgement or opinion about the answer is trying to 'steer' them towards the supporter's ideas.For example, if ideas produced by the person in dispute agree with their ideas they say "What a good idea" but if they don't they say "mmmmmmmm' in a 'doubtful' way. The dispute is not the supporter's, it is owned by the person in dispute. To trust that they have the capacity to create the best way forward is the greatest challenge of supporting people in dispute. But any other way does not work. Maybe we can convince ourselves with short term 'results' by 'persuading' people to follow our ideas. But long term it will always fail. And we will be long gone, perhaps congratulating ourselves what a great job we did solving their problem for them. "I’ll ask my brother to go and speak to my neighbour / work colleague / Doctor etc." Any question that remains open and without an ‘agenda’ but which follows on from the last thing the disputant said would be appropriate here. Purchase this e-booklet of the webpages describing all 3 skills with some additional comments and clarifications for just $3! Click here to find out more about this ebooklet. Following on from what they last said means that the supporter is genuinely listening to where the disputant is 'at'. Asking a question unconnected to the last thing said by the disputant means they are trying to take ownership again by following their own ideas and not being present with the person they are supporting. Some may argue: "Well there’s still an agenda there which is the mediator wanting to know the content of what is said or the mediator wanting to know when it happens." – but this misses the purpose of the question which is that the mediator is still supporting the party in deciding their next step instead of directing them. For instance, effective support would not be to say "So will you ask your brother to say you don’t want the noise to carry on? or "So, will you do that tomorrow?" – this approach specifies an action that has to be accepted or refused while the open questions above do not. An open question allows the person to create any one of a number of possible answers that work for them. A closed, leading question means the person can only answer yes or no to the disguised direction they are being given. The closed question approach is what often leads to the idea of ‘empowerment’ being looked upon with some cynicism as it is paternalism trying to pretend it is something else. It still harbours an ‘I know better than you and you should do as I say’ subtext which does not value the individual’s capacity to decide their own path. 'A powerful approach to promoting understanding in a conflict is to focus on asking questions and listening rather than on giving answers or solutions. A sincerely asked question does not leave you vulnerable to an attack as uninformed position-taking and will increase the rapport simply because you are acknowledging the other person as someone worth listening to'. The aim of mediation and any effective approach to conflict resolution and empowerment is to support the disputant’s creative thinking towards resolution of the situation. It is never to lead them towards a solution. People are quite capable of creating that for themselves. The role is to walk alongside the party and support them on their journey through practising effective listening, summarising and questioning, not to drag them along behind or push them in directions they may not want to go. This practice supports the disputant’s capacity to resolve their dispute. It allows the mediator to have an open acceptance of the disputant as just another human being on a rocky path and not as a failing human being needing to be told what to do, as if they are a burden to be carried. Instead of having to fend off suggestions and impositions and judgements and opinions from outside Rescuers, the disputant is supported, through questioning, in focusing on their dispute and how they feel about it and how it affects them and how they would like to bring about change in the aspects which cause them stress. An opportunity to reflect on the situation, to stand back from it and look in on it enables the disputant to untangle him/ herself from the complex web that surrounds the situation. The opportunity to visualise steps towards ways of changing their situation through questioning that supports creative thinking allows them to see a different, more acceptable situation for them to step back into in real life. The acknowledgement afterwards that the new situation was created by them instills more confidence in being able to do so again in the future. And through adopting this approach to supporting others facing difficult situations or disputes, whether as friends, parents, mediators, helping professionals, authorities, we take the self-imposed burden off ourselves and support the creativity and growth of others. 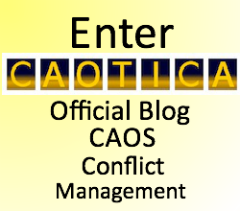 Alan now writes for CAOTICA, the blog of CAOS Conflict Management where he is Director - click on this banner to go to the blog and sign up for updates on articles similar to this on on themes related to effective communication and conflict resolution.